Sailing o'er the not-so-bounding main—that's because I took this picture later in the passage when the winds and seas were calmer. Yesterday we discovered that our hand of bananas was ripe and ready to eat (we had bought it from Richar just before leaving Isla Isabela). It must have weighed 40 lbs or so and there were more than 70 bananas. The hand had been suspended from the center of the boom gallows, occupying prime cockpit space, but nobody could find a better place for it. It really was in the way, and as the boat pitched and rolled the hand would swing wildly over the helmsman's seat. If you walked past the helm, sometimes the swinging stalk of bananas would give you a thump. I started calling the bananas "Mr. Banana Head" since they looked like a big head with green dreadlocks. One day, the stalk broke where it was tied to the boom gallows and Mr. Banana Head dropped into the cockpit. There wasn't enough stalk left to re-hang him, so Mr. Banana Head was lashed down on the aft deck. I don't think anybody regretted it when Mr. Banana Head vacated his place in the cockpit. David hacked a few bunches of bananas off Mr. Banana Head and left them in the cockpit as a snack for watchstanders. Last night, I enjoyed several bananas on my night watch—they were ripe and very sweet. This morning when I went on watch, Marcie and I discovered a line hanging down into the cockpit. The end was ragged and frayed like it had chafed through and we traced it to the reefing line for the mainsail's third reef. This is the line that was precariously routed around an exposed sheave on the end of the boom with no way to retain the line if it went slack. The line must have slipped off the sheave overnight and chafed through on the end of the boom. 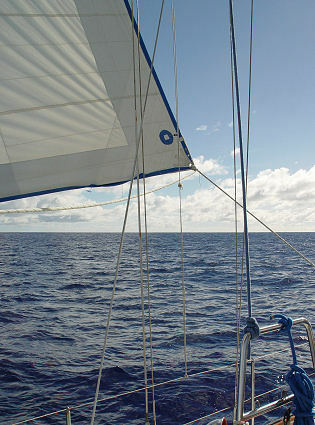 With the reefing line parted, the mainsail had a very poor shape and our boat speed had slowed quite a bit. Once David got up, as usual, he had chores awaiting him. To fix the reefing line, he ran a new line on the outside of the boom, using a spare block tied to the boom to act as a replacement sheave. This arrangement worked well, so our ability to use the third reef was restored. Just before lunch, we decided to temporarily switch to the starboard tack so Marcie could drain the galley sink and pump out the aft head (being heeled on the port tack in bouncy seas interferes with the operation of the through-hull fittings). With the sink draining properly, everybody got a chance to wash their hair in the galley sink. Naturally, you use the least amount of fresh water possible, and I used about six cupfuls, a dribble at a time. That was for two shampoos and rinses! 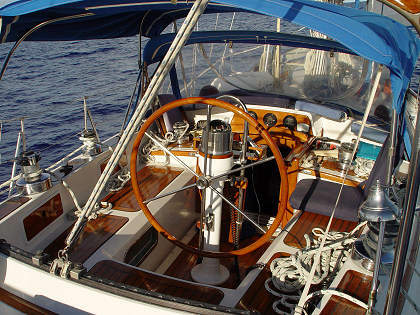 Nine of Cups' comfortable and secure cockpit, while sailing to Easter Island. As usual, the autopilot was steering. We usually have to run the engine during the night to charge the batteries. For the past several days, the battery voltage got low on David's night watch and he had to run the engine. Last night, the battery voltage got low earlier, on my night watch, and I had to run the engine. Whenever we run the engine to charge the batteries, we also run the watermaker to produce drinking water since the alternator produces enough surplus power to run the watermaker, too. When you run the watermaker, at first the watermaker output is too salty to drink, so you turn a valve to divert the water into the galley sink, where it runs out of a small spigot. But since the galley sink is not draining with this angle of heel, the resulting water winds up accumulating and sloshing around. Eventually you'd have to tack the boat to drain the sink, or scoop out the water with a cup into a basin, then carry it topsides and pour it over the side. To avoid this nuisance, David rigged a length of plastic tubing that slips over the end of the discharge spigot, runs across the cabin sole to the grating at the bottom of the companionway steps, then passes through a drain hole and into the bilge. This way, the waste water neatly drains into the bilge where it can be pumped overboard (since we pump the bilge every day). Once the watermaker runs for a few minutes to clear out the salt, you pull the tubing off the sink spigot, collect a good swallow of output water in a cup, and taste it. If it tastes good, you turn the valve the other way to direct the watermaker output into the boat's water tanks. Since we usually run the engine for an hour to charge the batteries, we run the watermaker the same amount of time and shut everything down at the end of the hour. The watermaker produces about 3-1/2 gallons of very good-tasting water every hour. While at anchor in the Galápagos, we were using about 10 gallons of water a day, which was for three people. It's not just for drinking, but also for cooking, washing dishes, brushing your teeth, washing yourself (with occasional showers and hair washing), and an occasional bucket or two of laundry (wash and rinse). While underway on this passage, we are using a lot less water. It's not possible to do laundry, since you can't hang it to dry (too windy and too much salt spray). It's difficult and even a little dangerous to take a shower so I don't think anybody has taken a shower yet. At best, you can take a "sponge bath", but even that is tricky and not very effective. We still use water for cooking and dishwashing, or I should say, Marcie does. My night watch was mild at first, then the wind and waves picked up, and thankfully so did our boat speed (which had been slow during the day). For a headsail, we are only using the staysail and avoiding the jib; the jib's UV-protection fabric needs some restitching and we don't want to make it worse. At one point during my watch, a small object came hurtling into the dark cockpit. I turned on my headlamp and saw that it was a medium-size flying fish, now flopping around on the cockpit sole with his wings extended. I was surprised by the beautiful two-tone deep blue color of the fish, very dark on top and a beautiful rich blue below. Previously, I have only seen flying fish close-up when I find them dead, on deck, when I check the boat on my morning watch. Once they're dead, they have a very bland color. Also, the live fish's wings were extended and were quite large, looking something like finch wings. Once they're dead, their wings fold up making them look smaller. After enjoying a quick look at my winged visitor from the deep, I picked him up by a wingtip and tossed him back into the water.